Senator Cory Gardner (R-CO) concluded the first of two days of his annual Colorado Farm Tour Monday with a stop near Eads. He had spent the day visiting farms in Kit Carson, Cheyenne and Kiowa counties. "My annual farm tour is an excellent opportunity to hear firsthand from the men and women that are part of Colorado's agriculture industry," said Gardner. "Throughout the week I'll be stopping at different farms and businesses across the Eastern Plains to see what I can be doing to best serve our farmers, ranchers, and small businesses involved in agriculture." Gardner started off the day in Kit Carson County at Eastern Colorado Seeds in Burlington. He then went to Cheyenne County to meet with some local farm bureau members before stopping at Nan's in Cheyenne Wells for a lunch meeting with county officials and additional farmers from the community. 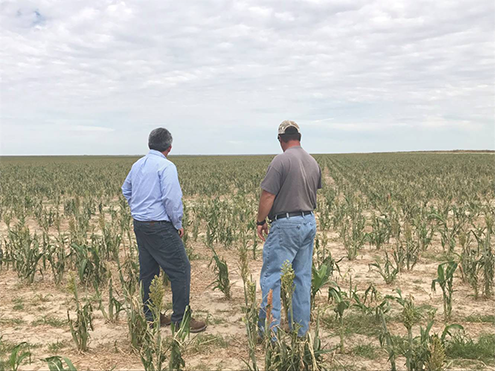 Gardner's next stop of the day was in Kiowa County at local businessman Jimmy Brown's milo field a few miles outside of Eads. Also included in the day was a separate stop away from the farm tour. Gardner visited Camp Amache, a Japanese Internment Camp that was near Granada during WWII and met with local high school students, as well as Granada city and Prowers County officials. "Two of the issues that seem to come up at every stop are government regulations and trade," continued Gardner. 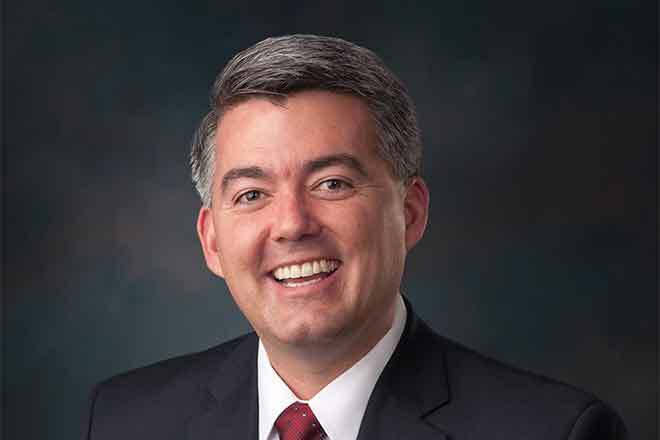 "I will continue to support efforts to eliminate burdensome and duplicative government regulations that hamper Colorado's agriculture community, and I'm going to keep pushing back on the Administration regarding any changes in trade policies that limit Colorado farmers access to new export markets across the world." Pictured: Colorado Senator Cory Gardner and Kiowa County businessman Jimmy Brown inspect hail-damaged milo.